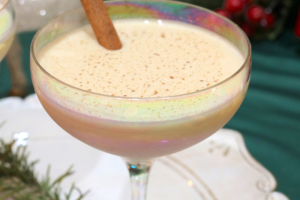 A deliciously creamy holiday cocktail! This peppermint martini is the perfect Christmas party drink for your next holiday celebration. Switching things up from the vanilla cranberry mimosas post from yesterday and OH MY PEPPERMINT GOODNESS! If there was ever a holiday cocktail that screams “CHRISTMAS IS HERE!! !” This would be it! This martini is SO. GOOD. I like peppermint but I didn’t know if I’d like a full on peppermint drink, but here we are! The swirls of mint and cream just make it so satisfying! This is definitely not your average martini. I would consider this holiday martini a dessert cocktail. The kind you serve after a nice filling meal and it leaves your guests with minty fresh breath. Personally, I think the garnish takes this drink to the next level, so although it is optional, I definitely don’t recommend skipping it! It’s quite simple to do, just melt some white chocolate, crush some peppermints and dip them in each like you’re adding salt to the rim of your margarita glass. Not only does it look good and add a touch of color, but it taste so good! It’s like having peppermint bark on the rim of your martini glass. Literally my “entourage” sat with the rim of the glass against their mouths the whole time! They slowly made their way around the rim as they sipped their drink here and there. It was quite hilarious! The entourage gave this amazing Christmas drink a thumbs up and were excited to try the next one! 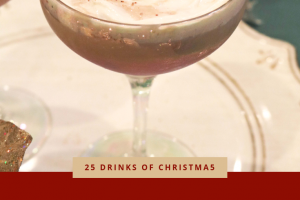 When I started this 25 days of Christmas, I knew I had to include a minty holiday cocktail. You can feel the rush of creamy with the cooling of the peppermint running through your veins and that can only make any peppermint lover smile! If you are a person who loves peppermint, stay tuned as I have another holiday martini you’ll love coming along these next few days! If you aren’t a peppermint person, stay tuned for tomorrow where I’ll introduced a new Christmas party drink. Perfect for getting you in the holiday spirit! A deliciously creamy Christmas martini with peppermint schnapps for a festive holiday cocktail. In a shaker with ice, mix together Rum Chata, Peppermint Schnapps, Creme de Cacao, and Half & Half. Shake vigorously. Melt white chocolate chips in a small bowl that will fit rim of martini glass. Add 5-7 peppermints or 1 candy cane into a food processor. Pulse until most of the big chunks of broken or to your desire. Pour onto shallow plate. Make a small circle the width of the glass rim. Dip martini glass rim into chocolate and then straight into peppermint bits. Pour drink into glass and enjoy! This looks SO good! Going to make these this coming weekend. thanks for sharing. 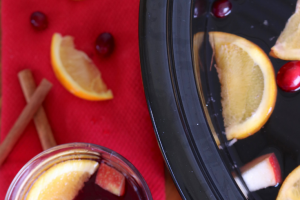 Oh my gosh, these are so fabulous for holiday parties!! YUM! !